If there was one thing Ashlyn Bellissa hated most in the world, it was being alone in someone else’s home. A close second would be cooking. Food preparation of any kind, to be honest. So how’d she end up with both in one day? Wiping her brow with the back of her hand, Lyn looked down at the mangled egg-halves with a determined kind of hatred. She’d begun to regret offering to make the devilled eggs now. Admittedly, the alternative would have only driven her further up the wall. Though Lyn enjoyed shopping as much as the next girl, the thought of enduring any more ‘girl-talk’ with her younger sisters was enough to make her want to hurl. All Jolee and Emma could talk about anymore were their respective significant others. It was all Jolee’s fault, too. In the five years that Emma had been with Louisa, Lyn hadn’t had to hear one blessed peep about their relationship. Not a single, smug, sappy or self-satisfied remark. But now that Jolee had gone and gotten herself hitched to some dark-and-handsome fitty named Gage, the two sisters had taken up every opportunity to swap cutesy, candy-coated stories. It was positively sickening. It wasn’t like they were all that special, Lyn mused. She cleared the ruined tray and filled the pot to boil a new set of eggs. Couples married all the time. They made silly, stupid promises to one another and ran each other through ridiculous obstacles just end up three times older and ten times more bitter. What was the use in celebrating that? She’d rather celebrate an achievement worth recognizing — Jo’s new publishing deal, for instance. Taking care of that process was the only thing keeping Lyn from returning to England. Sure, she’d initially flown out after Jolee unexpectedly invited her to be a bridesmaid, but that had been excruciating. The steady flow of readings and author-lunches, on the other hand, were exhilarating. Jolee’s memoir, ‘A Chipped Cup’, recounting her abusive affair with her older student five years ago had hit the markets like wildfire, and was only bolstered by her unwavering fundraising fervor to support local battered women’s shelters. Now that was something to put all one’s weight behind. If she could only get pumped enough to get these stupid eggs done right — Might as well enjoy a small glass of wine while the shells loosen. Reaching for her goblet, Lyn caught a glance of her reflection in the kitchen window. She hadn’t had the time or energy to put her makeup on, and the sight of her own face startled her. Smudged remnants of last night’s mascara ringed her eyes like a vigilante’s mask. Powdered foundation clung to her crow’s feet, orange streaks of skin already browned by years lounging on European beaches. Her roots, brown as her sisters’ hair, were beginning to show under her bleached-blonde hair, tied back at the nape of her neck in a sloppy bun. It was a look that would have horrified her, had she been back in Thetford. There, she was used to friends and neighbors dropping by at any time of the day, ready to take her into town to stroll about the pubs and shops until dark. She rarely did so with Jo and Emma, however. The only time she left the house with them, after the clamor of the wedding died down, was for formal events that she had plenty of time to prep for. Lyn knew she was avoiding her sisters, and it was more than just their insufferable need to talk about their partners. Lyn had just never been good with family. The more her sisters tried to include her, the more isolated she felt. For example, the way Jolee had greeted her when she had first flown in to Colorado. Emma had arrived first by a couple of days, and had already settled in with Jolee’s friends and husband-to-be. Emma had hung back with them awkwardly, her arms full of packages, as Jolee ran forward to embrace Lyn. Jolee had even called out to her in French between her happy tears. After years of living in England, however, the words seemed clumsy and alien. Sure, she could still speak her mother tongue and understood it well enough, but she was used to only hearing it from her mother. Even Emma knew to speak to Lyn in her preferred tongue. Which was English. Boarding school in Epping, combined with her choice to move near there permanently in her late twenties, had almost completely erased her accent. It just went to prove that Jo still thought of her as the nine-year old sœur aînée that she had left behind so many years ago. While Emma was perfectly happy with picking back up her sisterly relationships like nothing had ever happened, it made Lyn uncomfortable. She stuck it out, however, because the two seemed so thrilled to have her around. Besides, after having just been laid off she could use a vacation. For all her travels, she’d never been stateside before. She had to admit, Colorado was quite a beautiful place. Jolee and Gage’s wedding had taken place in a gorgeous Catholic chapel in the mountains. Since it was late spring, the outdoors reception had been naturally decorated with blossoming native flowers. Lyn had spent most of the ceremony gazing out at the clear greenness in a contented haze. Emma had needed to give her a sharp, impatient nudge for her to even notice that the wedding was over. The reception had been an awkward kind of avoidance-dance. Jo and Gage were making their rounds as a newly wedded couple. Emma was ecstatically making up for lost time with their father, Maurice. Considering that Emma hadn’t seen him since she was five years old, Lyn had thought there would have been a little more…awkwardness. Instead, they’d ended up glued at the hip the whole night. Emma followed Moe’s every movement like a lost puppy. After the wedding, they’d continued to meet up for several lunches in order to ‘strengthen their bond’, as Emma put it. Lyn wasn’t interested in strengthening anything with Moe. She hadn’t had a father for the past twenty-five years of her life, and she most certainly didn’t need one now. She was thirty-four years old, for Pete’s sake. She made fun of the girls with daddy issues that she saw at the clubs. She wasn’t about to blubber her way down into that mindset if she could help it. So she had left Moe to Emma’s care, ducking out of sight every time the pair seemed to be headed her way. Two more weeks. That’s how much longer she had to enjoy the States while simultaneously avoiding her family as much as possible. She glanced up at the clock and back at the eggs, almost fully boiled. She would have to be careful with the shelling this time. It was already half-past noon. Jolee and Emma were supposed to be back around one-thirty with the last minute decorations and Lyn had yet to finish the potato salad or cheese tray. She took another swig from her glass. C’est la vie. It’s not like it would kill anyone to wait five more minutes for their hors d’oeuvres. The party didn’t even start till two anyhow, the guests arriving with blank checks and books to sign. Jolee’d been holding these fundraisers almost every weekend since Lyn had been there. Lyn supposed Jo held them out of some kind of seeded guilt. The house Jolee now lived in had been a wedding present from her father-in-law. Mr. Aristade Senior in turn had been rumored to have bought the house with the insurance gathered from the mountain mansion that had burned down ‘mysteriously’ after Jolee’s stay. Jo herself confirmed this, saying that the ‘gift’ had in fact been a bribe to keep the name of his disturbed son, Adam, out of her manuscript. Though she had never planned to out him in her novel, Gage had convinced her to accept the bribe. Jolee had taken it for Gage’s sake, but used the large house for charity gatherings. Her novel had sparked a kind of non-profit organization called ‘Chip’s Hope’ that raised money for struggling shelters and relief for domestic abuse victims. She put on presentations for her local patronesses, did readings from her harrowing memoir, signed the book and answered her guests’ questions, all while parting them from their money like a knife through butter. Though she was by no means a household name, Jo had become somewhat of a local celebrity, if nothing more than for her unending determination about it. She’d raised a decent amount in five years. It was enough because Jo was wildly passionate about it, and delighted when she could pass even the slightest of that passion to someone new. In Lyn’s opinion, it was a whole lot of work for very little profit. The kind of horrid violence that Jolee and her poor friend Chip endured wasn’t something that happened every day, right? Everyone knew what kind of secret things happened in the homes of alcoholics and the mentally ill. There were plenty of places for battered women to go already. It wasn’t like anyone could force them to get help. If Lyn had published a successful book like her younger sister had, she would have considered her good deed to the world penned and finished. Why waste her royalties on entertaining large groups of people who would repay her by throwing their money away on some poor men and women who just fell in love with the wrong sorts of people? It’s not like she could tell this to Jo, of course. Her little sister was just so enthusiastic about the whole thing. It wasn’t like Jolee was a bubbly person or anything either. Jolee was struggling in those large groups, and Lyn could see how hard Jo had to work to keep from hiding in a corner. For outgoing Emma, the gatherings were a breeze. Lyn suspected that, if Emma hadn’t been here, Jolee’s parties would have been total flops. But Jo’s sheer willpower was a kind of bulldozer. Lyn could see that, the longer Jolee kept holding these shindigs, the more comfortable she would become with people in general. Well, good for her. It might not be the kind of life Lyn would want for herself, but hey, who was she to judge? For now, all Lyn could really do was enjoy her little family vacation and all the nice food and wine that came with that. Which, speaking of — Lyn peeked over the edge of the boiling pot. The eggs should be done by now. She turned off the stove top and drained out the water. Though it was frustrating to be cooped up in the house alone for so long, she had to admit it was nice to be able to think her own thoughts without too much interruption. The cracking and rolling of the eggs as she carefully peeled off the shell served as a calming kind of white noise. It was technically work, and she would never admit that she enjoyed even a second of it, but it provided her the freedom to let her mind wander without the well-meaning judgment of her siblings. Speaking of her sisters, a loud knock snapped her out of her reverie. Why didn’t they just come inside? Did they honestly buy so much that they couldn’t just open the door themselves? She set her devilled eggs-in-progress aside and headed for the door. Lyn looked up at the clock as she passed. Not even one-twenty. They sure had come back early. Did she need to take her shower now? She most certainly wasn’t ready for any kind of company, and she hoped like heck Jolee and Emma hadn’t decided to push up the party time for some reason. Three pairs of wide, green eyes stared up at her expectantly. There were two girls and one boy, each of them with thick, almost black brown hair and square, sharp faces. The girls wore plaid jumpers that seemed a bit too long for them with flowery white blouses beneath and shiny black Mary Janes. The boy, in contrast, wore khaki pants with grass stains on the knees and a dark green polo hastily tucked in and torn-to-pieces Sketchers. They all looked around ten to twelve years old, though she couldn’t tell who was older than who. “Can I help you?” Lyn asked. The three exchanged glances, each more hesitant to answer than the last. Lyn sighed. She didn’t have time to deal with this. “I don’t have any need for your Girl Scout cookies,” she said as she began to close the door. The young boy’s arm shot out reflexively, preventing the door’s closure with a sudden resolve. Shocked, Lyn took a step back. The young boy’s eyes had narrowed, his lips pressed into a hard line. But that didn’t scare Lyn. What did was the look in his eyes, so bright and glittering with a mix of sadness and hope. She had seen these kinds of eyes before. It was amazing how quickly the pain had dissipated. For the four hours she had labored, she had been convinced every single minute that she would die. She wasn’t sure if maybe that would have been better for everyone. But they were born now — those three, pink wriggling things with their soft hands clenched tight and their round bellies covered in blood. It was like they weren’t even human. There was no way she could claim those little changeling piglets. The nurse had tried to force them into her arms while they were still screaming for breath. Lyn had screamed right back into their tomato red squashed faces. The nurse, startled, had taken the triplets away, presumably to keep them safe from Lyn’s rage. It would be the last time she would see those little wrinkled monsters. What would she tell Phillipe? He had begged her not to fly to England. She was too pregnant, he said. It was too dangerous, he said. So she had said okay and immediately bought two tickets, one for the train and another for passage across the English Channel. Phillipe had been so angry when he saw it on their bank statement, but his screaming had gone in one ear and out the other. She’d slipped out of the house while he was at the stables, with only one change of clothes and plenty of money. She’d called the aunts in tears. They were the only ones who knew she’d left. She abandoned her phone at home, and could only imagine what kind of a din it would be raising as soon as Phillipe noticed she was gone. The train ride had been bumpy, rattling through the high winds of fall so hard that she’d thought her great belly would shake right off. She’d hoped she’d miscarry right then and there. It had been a horrible nine months, carrying that bloated ball of skin and growing tissue around and never being able to rid herself of the horrible soreness always in the small of her back. But it remained suckered to her all the way to England, where the soreness built to a point where she could barely stand. The aunts had to almost carry her off the ferry when she arrived. The contractions began in the back of their four-door sedan, and they had to change course halfway through, settling for a hospital near the channel instead of braving the trip all the way back to their home in Epping. The little monsters were three weeks early, as if they knew the fate that awaited them. They wanted just as much as she did to finally be rid of her body and free to become parasites for a much more doting host. She’d nearly fainted, seeing the first of their little heads sliming their way out from between her legs. She’d only been able to breathe again without wanting to vomit when they were all fully squeezed out and taken from the room. She blinked slowly, feeling the road before her fuzz and blur as she drove mindlessly down the side roads of Dover. The aunts were probably wondering where she’d run off to by now. Lyn had left all three of them in the waiting room, slipping past them easily as they talked excitedly together. Just like all the other aunts at the hospital, slavering like dogs to see one little first clench or to witness a tiny yawn from those miniature humans. They hadn’t expected to see Lyn so soon after giving birth, and so they hadn’t thought to look up as she had rushed out. She wondered how long it would take for them all to notice that she had gone missing. It made her shudder to think about those little babies, blinking like lizards. To think that not one, but three, of those little newts came from her belly — a wave of nausea came over her again. She pulled over to the side of road and into a small parking lot, leaving her small rental car to find some kind of hostel or motel in which to stay the night. She had originally planned to stick with the aunts, but after seeing how they’d fawned over the birth, she felt no alliance with them. She’d had to kick them out of her room as the children came, promising to call them back as soon as they’d been born. Instead, Lyn ran. She didn’t want her exhaustion to cause her to slip up with her story. The aunts had only agreed to take the children to the orphanage and watch over them because Lyn had told them that Phillipe had been beating her. Had to tell them not to tell Mamere or Emma, either, because they had taken his side and would come and take the children back. They would come take the children back, but not because Phillipe was abusive. Lyn had needed to cover her body head to toe to keep the aunts from seeing her lack of bruises. Phillipe would never hurt her. He was a sweet, sweet man, always had been. Spent all his time with the horses, breaking them in and caring for them beyond all call of duty. For nine months he’d come back from those stables reeking of horse manure, hay falling from his hair. He would kneel at her feet where she sat eating dinner on the couch and place his face right up against her skin. She could feel every ridge of his ear pressing into her belly as he sang to her womb. He would switch fluidly from English, to Spanish and back, waiting for the fetuses to respond by pounding out in impending escape on her stomach walls. But Lyn couldn’t sing. Not anymore. Not to them. Couldn’t he see how horrible this all was? She was twenty-two years old, and Phillipe twenty-six. They’d barely been married for a year. There was so much Lyn had wanted to do with their new life together. She had wanted to backpack across Europe. She had wanted to go to Egypt, and the Harajuku district, and the classier parts of Ireland during the high tourist seasons. She’d wanted to open her own fashion line and open a boutique shop in downtown London called Roue de Rotation, after a line she’d admired in a Perrault tale from her girlhood. She’d wanted to go clubbing every night, with her fit Spanish husband on her arm, becoming a celebrity of media as well as the design business. She just had to get pregnant. Because of it, she’d been forced by Phillipe to give up her impending internship with a London brand in order to move to France. A woman should be with her mother for her first, he had said, and within a week they were living in Mamere’s guest room. Her younger sister, Emma, was at university at the time. Her mother, though hard at work in banking, refused to let Lyn leave the house for any reason that wasn’t deemed necessary. Cooped up in the home she’d never really known, Lyn felt herself slipping away. It was like the growths in her belly were swallowing her whole, replacing her. She slept most of the time, sometimes sleeping for whole days at a time. The days blended together, there on the couch as her ankles swole and her cheeks bloated. She began to measure time by the inches of girth she’d gained, rather than hours. How could Phillipe be so calm, so excited? Their marriage was unraveling barely after their first anniversary, all because she happened to be so unfortunately fertile. Their lives had barely begun and it had almost been over, leaving her to clean up this whole mess alone. But she wouldn’t let that happen, no. She’d rather… eliminate the problem. She couldn’t kill them, of course. She’d been shown their growing hearts and felt their tiny pulses. Her chest had tightened, squeezed until she didn’t know what made her sicker: the idea of being a mother or signing the paperwork at the corner clinic. But she’d fixed that, now. The triplets had been left with the aunts, who would see them safely to the nearest orphanage and make sure they got a set of parents who were ready for them. Lyn had promised that she would come back for the children once it was ‘safe,’ of course. The aunts wouldn’t have agreed otherwise. But Lyn was never coming back. She and Phillipe had too much to work out to be good parents, no. This was the best choice for everyone. It didn’t mean she was poor, or struggling, or failing. She was just too young to be a mother. It was hard enough being a wife with so much life ahead of her. Motherhood was something you resorted to when you’d lost all your vim and vigor. Lyn wasn’t ready to roll over and die just yet. Though she was ready to sleep. She climbed the stairs to her cramped, single mattress room in a state of exhaustion. Not much she could have gotten, at this short of notice. She’d barely brought enough money with her for the night’s fare, and she still needed to get back in the morning. Lyn found it hard to care about any of it, though. The pain had been long gone, replaced by a dullness that extended through all her veins and tingled in the pads of her fingertips and toes. She laid out on the bed, resisting the urge to lift her legs. To labor through the phantoms of her deflated belly. She stared at the ceiling, made of the same Styrofoam white tiles that she had stared at in the hospital. She had to keep from seeing those babies crawling out of her, slimy and alien. The ceiling blurred as her tears caught in her lashes and beat against her hard, unforgiving cheeks. She cried warm, salty streams for hours, clenching the bed sheets and staring at the ceiling with a manic focus. But no matter how hard she stared, she remained in that bed. She could not transport to the bed of hours already passed in bewildered regret. By now, the aunts would know that Ashlyn wasn’t coming back. They would have looked at each other and shaken their heads and helped fill out the paperwork. No point in turning back now. There would be no facing them. She’d disappointed them plenty enough times before. Unlike Mamere, the aunts knew Lyn. They’d always known who she was, straight down to her bones. Hopefully, them raising her for nine years had prepared them for her betrayal. She hadn’t wanted to break their hearts — . Lyn blew her nose, feeling congestion clogging up her mind. That’s what it was. She was getting sick, and that’s why she was having second thoughts. She had made up her mind. She had been brave and done what was needed to save her and Phillipe. What was needed to keep living a vibrant life. What she needed now was sleep. Though her body ached for rest, her mind was racing far too quickly for even dreams. But there was a solution for every problem. Even for nightmares. In her purse was a bottle of sleeping pills that shook like a rattle as she pulled it out. She pour the entirety of the bottle’s content out on to the plain yellow comforter, counting sixty white pills in all. After a long moment of hesitation, in which she counted them over and over, she picked two up and washed them down with water from the bathroom faucet. The others she swept from the bed onto the floor, where they would watch her with their stale, pupil-less gaze until she had no choice but to drift off into a cold, dreamless sleep. 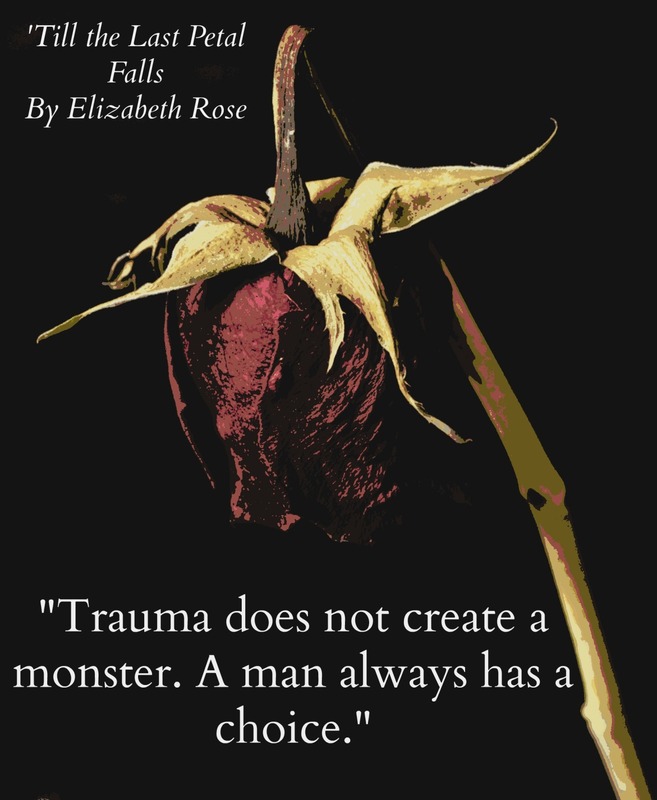 *samples copyright 2014 Elizabeth Rose, ‘Till The Last Petal Falls published by eLectio Publishing June 2014. Sample chapters may or may not have undergone changes before final print, or in subsequent editions.